World Youth Alliance | WYA NA Celebrates Cathedral High School Club! Last week, WYA Cathedral High School chapter celebrated the conclusion of their 2016 – 2017 school year and the club’s four year anniversary. There were certainly many milestones and accomplishments to celebrate, and Weronika Janczuk (WYA NA RD) and Julia Kenney (WYA NA RDO) were so pleased to join them! For the past nine months, the chapter’s student leadership team planned and facilitated monthly meetings. Each meeting involved a discussion surrounding a topic relevant to the high school culture. Afterward, they wrote the chapter’s commitment of their person-centered response. In addition to the monthly meetings, the chapter also participated in a variety of special activities. 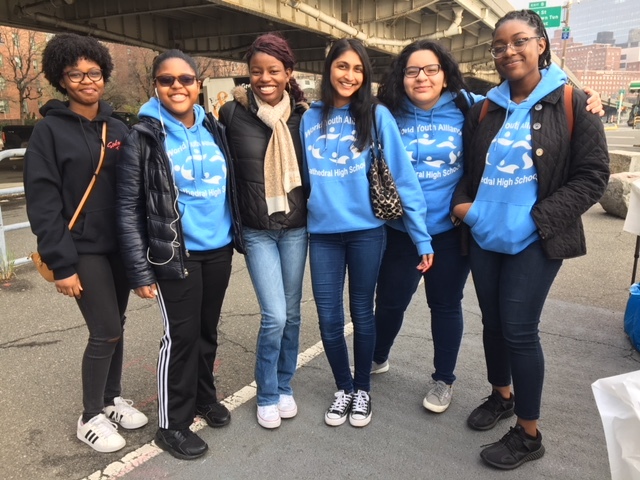 They hosted their annual Breakfast Run, a service event where the chapter members fed homeless persons in the midtown Manhattan community. They also participated in a Model UN, moderated by WYA NA intern Allie Rose, based on the 2018 UN Commission on the Status of Women (CSW) theme, “Women in Rural Areas”. During the CSW, the chapter members joined the WYA staff for the Holy See Mission’s side event, which featured FEMM, WYA’s affiliate organization, and its effectiveness in meeting the healthcare needs of women from rural areas around the world. It was a great pleasure for Julia and Weronika to celebrate the accomplishments and service of the Cathedral High School WYA Chapter. The WYA NA staff wishes special congratulations to the clubs graduating seniors, Brianna Ellington and Ashley Loor, both of whom have participated in the chapter in all four of their high school years. Julia and Weronika look forward to many great things that will continue to unfold for the club next year!